We love the possibilities partnering with like-minded affiliates.The more we share God's recipe for health the greater the blessing.Thank you for considering joining us on this adventure - sharing how Scripture and nutrition intimately coincide. 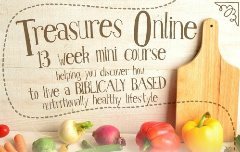 Our 3-pack collection; Treasures of Healthy Living Bible Study, Treasures of Health Nutrition Manual and Healthy Treasures Cookbook. Do you note a theme here? Let us know if you want more and we will work to match your requests.